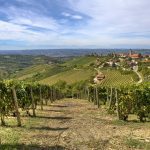 Stretches of rolling hills, as far as the eye can see, ancient villages and perched castles, gentle slopes covered with vineyards: these are the magnificent views of Langhe and Roero, that have become a World Heritage site. These are the wonderful wine producing areas of Piedmont that made it into the World Heritage list because of the combined modelling of the land by nature and by man. It is the breathtaking views and the genuine foods offered by this rich territory that we propose in our fabulous tour. Price: 1876,00 eur p.p. in double room 06.05.-26.07. & 30.09.-27.10. / 2070,00 eur p.p. in double room 01.04.-05.05. & 27.07.-29.09. Individual arrival in Alba, check in at the hotel and free evening out. Overnight at the hotel. After the breakfast you will leave the Langhe’s capital Alba. A flat ride out of the town will help to stretch your legs and warm up, just in time for the first short climb to the surrounding hills. 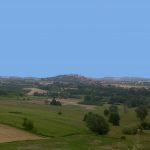 From here you will have a first taste of the marvels this territory has to offer: stretches of hills, castles, fortresses and steeples sitting on their tops. Along the way you can stop for a typical lunch. From here you will move along the crest of the hills, on mixed routes, as you go through the main villages and castles. 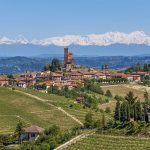 Have a stop at the charming Grinzane di Cavour Castle where you will find the first established Langhe regional wine shop and Museum. 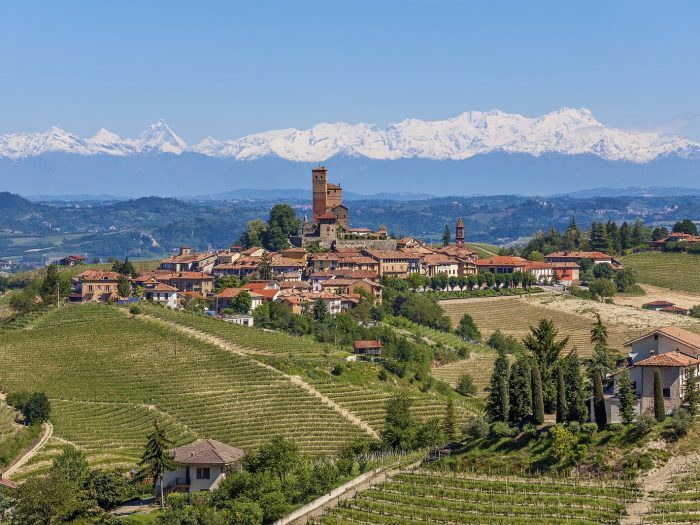 Then move on to reach the heart of Barolo, famous for the eponymous fine wine . Dinner and overnight in a characteristic farmhouse or B&B in the Barolo area. 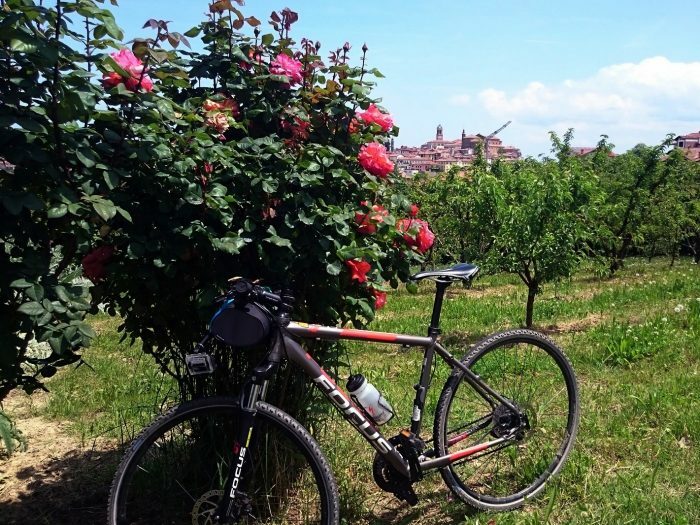 After the breakfast you will ride once again on the crest of the hills towards Monforte d’Alba, one of the most interesting historical centres of the Langhe with its main square and the ancient church that has a prominent view of the Superior Langhe and its endless hills. Then take the road towards Dogliani. This territory is a wonderful mix of the agricultural richness of the land, especially with its vineyards, blended with the local artisan culture and the hospitality that you will find in the people hosting you in restaurants, wineries and hotels. 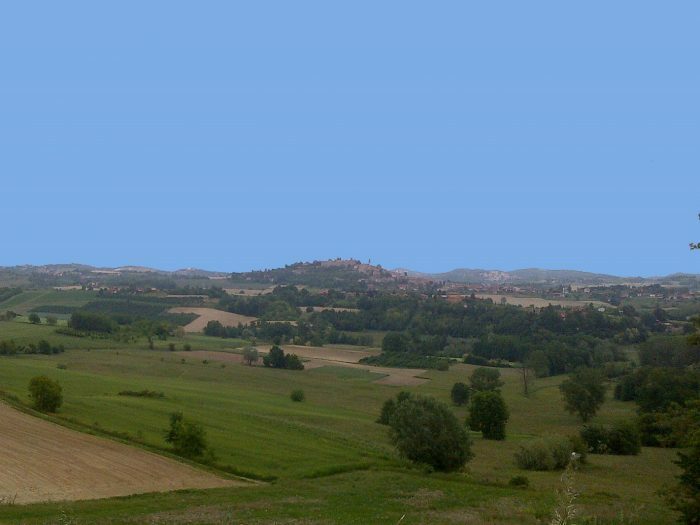 From here you will ride towards Serralunga. 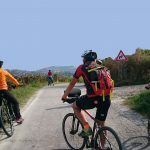 The particularity of this route is that it goes from gentle to very steep slopes, but you will be keeping your altitude fairly constant so as to avoid the hardest climbs. Dinner and overnight in a farmhouse/B&B, in the Serralunga d’Alba area. 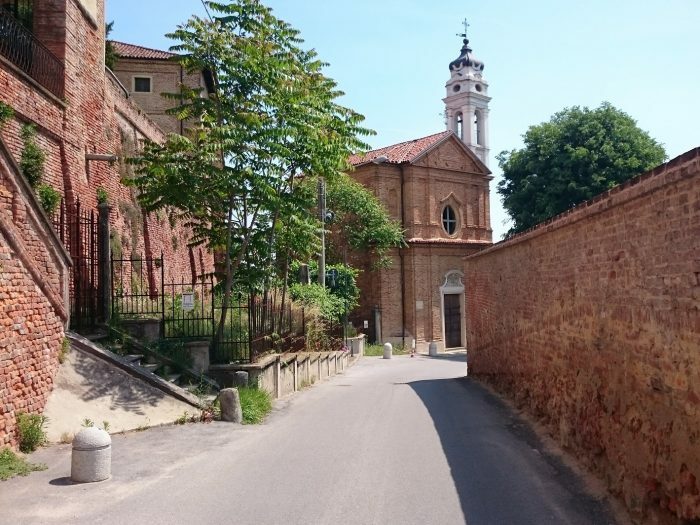 This morning you will leave the Serralunga area to head towards Lequio. 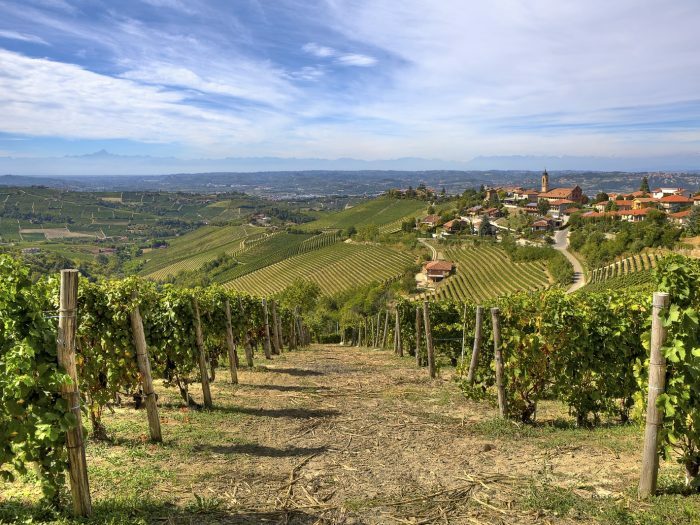 The highlight of today’s tour will be the breathtaking view that goes from the Lower Langa (the wine territory from where we first departed) all the way to the Higher Langa which is dominated by woods and by the cultivations of a fine hazelnut variety called “the gentle round of the Langhe”, bordering the Liguria region. Stop for a light lunch. The route continues eastward on the hill lines, slightly increasing in altitude. This last stretch is short, but quite challenging! 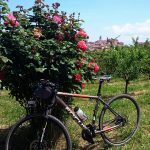 You are on the top of the Langhe at an altitude of 700m, which will allow you to enjoy a 360° panorama of this amazing corner of Piedmont. The effort is fully repaid by the postcard-worthy views, and tonight’s dinner will gratify even the most fatigued. Dinner and overnight in a farmhouse/B&B, in the Lequio Berra area. Today will be an easy ride! 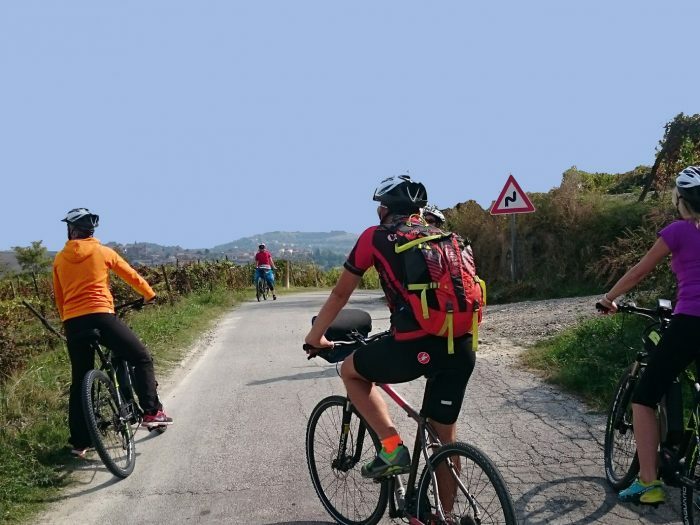 You will ride towards the Belbo valley and you will cross Benevello, located at an altitude of 671m above sea level, this is the first village to belong to the Higher Langa Mountain Community. 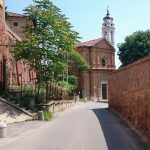 From the little church of the Madonna di Langa you will enjoy a unique view on Southern Piedmont, all the way to the Alpine group of mountains. Head towards Mango, best known as one of the major production areas of the Moscato DOCG wine. Finally you will reach Neive, its historical centre maintains a Medieval structure, made of cobbled streets that wind up to the Clock Tower and to the refined palazzos decorated in terracotta. This village is considered one of the most beautiful in Italy ! Dinner and overnight in characteristic farmhouse/B&B, in Neive area. cultivated with orchards and vineyards. If you prefer to visit Alba you can get there with a downhill shortcut. Dinner and overnight stay in Alba. Breakfast at the hotel. If you have not visited Alba yet, we suggest you to go for a coffee in the charming Piazza of the Duomo. Arrivederci!